Most .380 ammunition that makes claims for their capability fall short, whether they can’t expand uniformly or whether they cannot achieve the penetration needed to make the .380 Auto an effective threat stopper. This is not a problem for this MagTech 85 grain projectile with the uniformity of expansion and expansion reliability in general on the high end for the caliber. The penetration is also above 9 inches, a feat for most .380’s. The resulting threat stopping capability is incredible for a round (.380) that in the past could be described at times, as anemic. 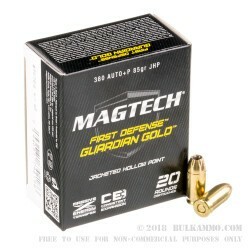 Another note in the favor of this MagTech First Defense Guardian Gold JHP in 85 grain: it’s speedy and generally doesn’t have the feeding and functioning concerns that plague many .380 Auto loads. The 1080 feet per second velocity that is achieved out of the barrel tends to be enough to cycle most firearms, even factory new, unfired guns in many cases. The round is also boasting a 220 ft. lbs. energy number, which is on the high side for event he premium loads in .380 Auto. All of this equates to a very solid choice in the premium hollow point field for the .380 Auto. 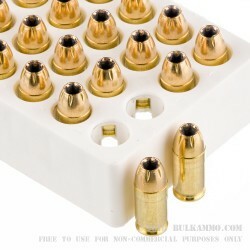 Essentially making the performance of ammunition like this, part of the reason that .380 is so popular again. Q: What is the Muzzle velocity and the foot pounds per square foot? A: Hello Richard, These 85gr. 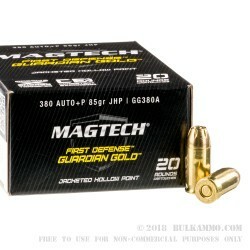 JHP +P rounds in .380 Auto by Magtech have a muzzle energy of 1082 fps. and a muzzle energy of 221 ft.lbs. 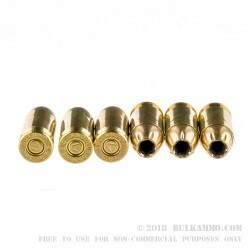 They make excellent defense rounds for your .380 firearm.